The weatherman is calling for sun and temperatures in the 80s tomorrow, so, in celebration of Dump the Pump Day, take the opportunity to ditch your car and try commuting a little differently. Catch some early morning fresh air on your bike or let somebody else do the driving on TARC. To find a good route to bike to work, check out Ride the City, which let’s you choose Safer, Safe or Most Direct routes based on your comfort level. Ride the City also offers a mobile app for iPhone. Live too far from work to ride the whole way? TARC buses are all equipped with bike racks so you can bike to the bus and ride the rest of the way or vice versa. Don’t know how to use the bike racks? Mr. Theo and the TARCettes have you covered. If you live close to a TARC stop, maybe you can even ride the whole way. 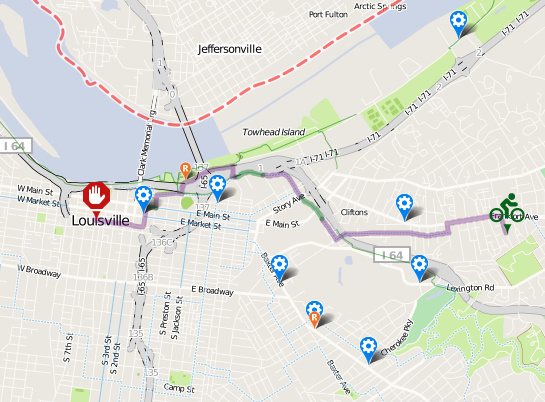 Check out TARC’s online trip planner to find the best way to get to work on the bus. The bus fare is $1.50 and transfers are free. While you won’t be able to arrange it in time for tomorrow, take a look at KIPDA’s Ticket to Ride vanpool program. Will you be Dumping the Pump tomorrow? What could Louisville do to give people incentives to ditch the car on the commute? Louisville really has the potential to lead the way with alternative transportation. It’s pretty flat and pretty small, considering. I’ve found, after 1.5 years of not having a car, that there is so much within biking, walking and TARC distance. Sure, our streets could be safer/slower for bikes. Sure, our sidewalks could be better. Sure, TARC could have a world-class iPhone app so more people would consider that as a feasible mode of transportation and give up the one-person-per-car syndrome that infects all of our stoplights and interstates. Our city is beautiful and unique, and each day I’m in it on my bike or on the bus or walking, I notice something I’ve never seen before that further endears it to me. Not only is it transportation for me, it’s exercise, meditation AND stress relief. And beauty. And history. And community. Please don’t make judgements unless you’ve seriously gotten out there and ridden, walked or TARCed. Too many people say, “It’s so DANGEROUS!” without actually trying. It just so happens that on this same day there is a really neat event happening on the Louisville Boat Club’s dock. SES technologies, a Louisville based company, has developed something called a Renewable Power Resource Station. Its a mobile unit (and by that I mean a converted single axle trailer) that uses solar panels, a wind turbine, a hydro generator, and a small Natural Gas generator to create zero-input power in a disaster relief situation. It could be used to provide electricity for anything, like an aid station, a field hospital, or a shelter. At the demonstration tomorrow, it will be powering a 52′ mobile command center and a low-tech water purification system (created by EDGE Outreach, a Louisville non-profit) that will provide the center with potable drinking water. So if your biking or carpooling down River Road tomorrow from 11:00-1:00, please stop by the LBC dock to see an awesome demonstration of green technology being used to save lives. Apologies for the shameless plug, but I couldn’t resist. @Mary Beth Brown – I agree totally Mary Beth. I’ve only been here three and a half weeks and already I’ve seen so much on the bus and my bike. When I told the friends I’m staying with I would be going car-free while I’m in Louisville, they got very concerned about the idea of me riding a bike around. Like you said: “It’s very dangerous.” Quite the contrary, I’ve found. Drivers have been overwhelmingly deferential to me on my bike and the relatively good street grid inside of Waterson offers any number of options to get from A to B.